We took a last look out the window this morning. 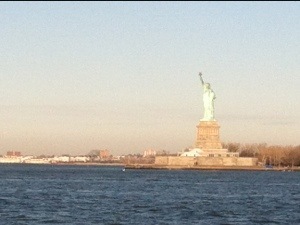 That’s the Hudson River, with New Jersey on the far side. 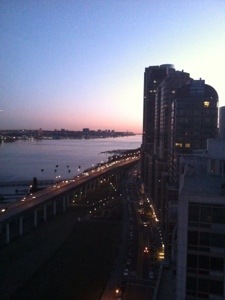 Look carefully and you can see the George Washington Bridge. 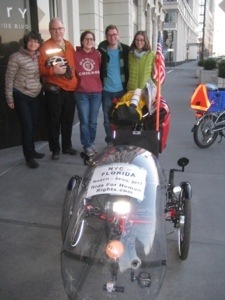 Kathy Jones and Lauren Trinka of Human Rights First came to see us off. So did Jeffrey’s family. I was in a plastic bag bungeed to the back of the Sprint. 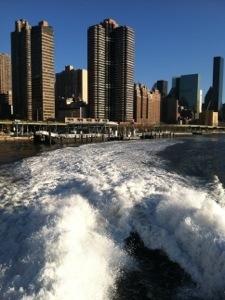 We took the Seastreak Ferry from E. 35th Street. 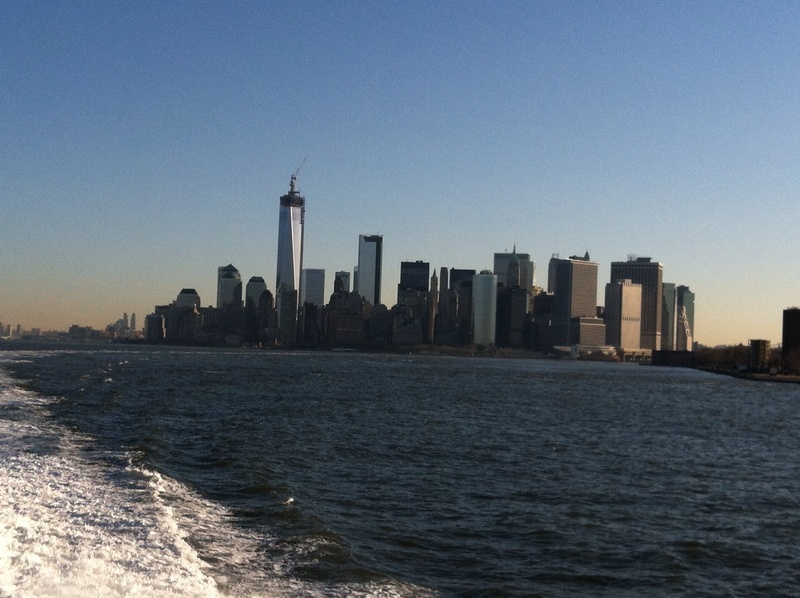 We passed under the Williamsburg, Manhattan, Brooklyn, and Verrazano bridges, seeing much of the Manhattan skyline along the way. 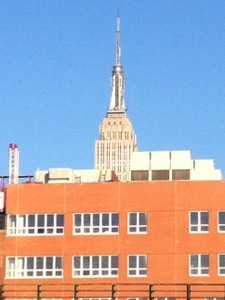 Look for the Empire State building, and the Freedom Tower being built on the World Trade Center site. 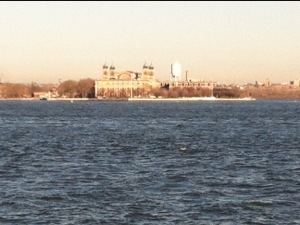 You can’t miss Ellis Island and the Statue of Liberty. 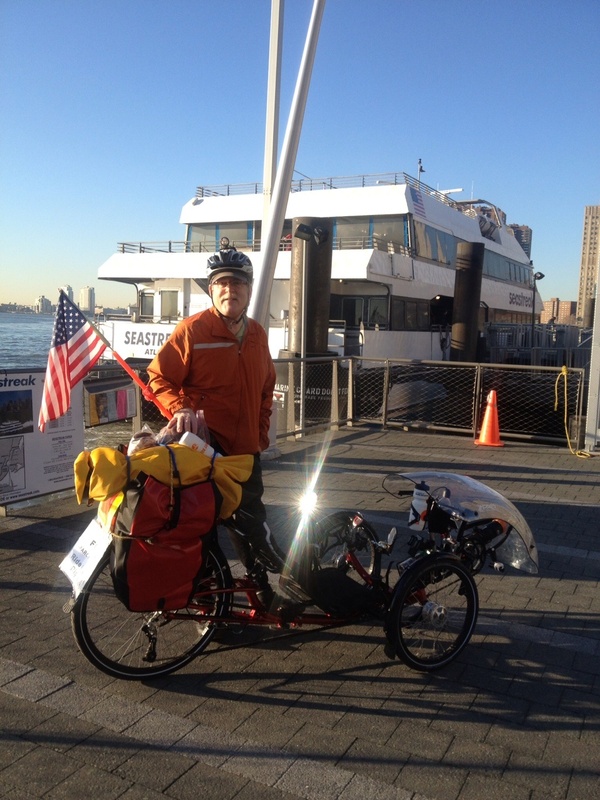 One of the ferry crew, a former merchant seaman, asked Jeffrey about the Ride. He gave us some valuable route advice in the bargain. 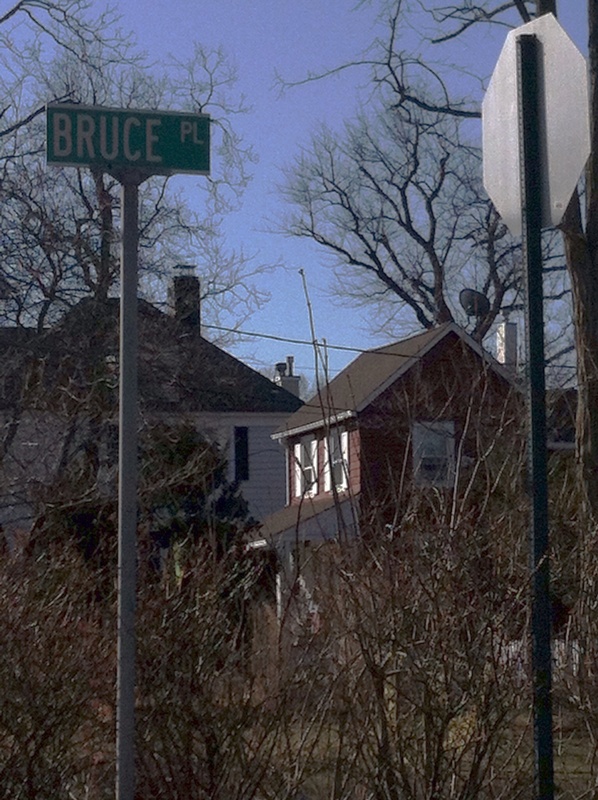 Instead of following the Mapquest walking directions, we went from Atlantic Highlands (where a kind woman in an SUV called out to us and asked about the Ride) to Rumson, where Mr. Springsteen lives. 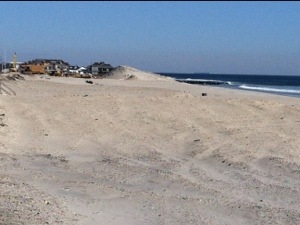 Then to Sea Bright, which still has a post-Superstorm Sandy curfew on side streets, and is full of construction sites. 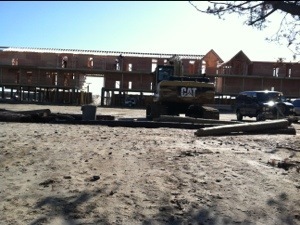 Brand new buildings are going up near the beach; the structures that had stood there were totally destroyed. Across the road, buildings had been damaged but not washed away. New Jersey drips history. 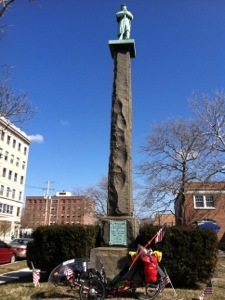 This post-Civil War (“War of Rebellion”) monument is in Asbury Park. In Manahawkin we passed a marker for a Revolutionary War skirmish. For you Shore aficionados, here are some of the other towns we passed through: Monmouth Beach. Long Branch. Deal. Ocean Grove. Bradley Beach. Brick. 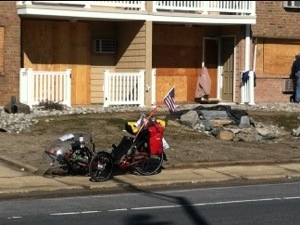 Toms River. Forkéd River. 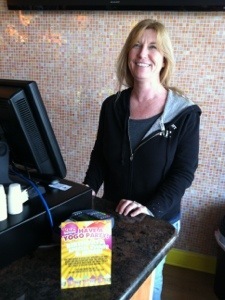 In Lanoka Harbor, Jeffrey stopped for some frozen yogurt. Renee, the kind shop owner, asked about Human Rights First, then would not let Jeffrey pay. Today we saw a few laborers who had the look of people from south of the U.S. border. But unlike more-inland and more-northern New Jersey, we did not see shops and signs in Spanish, except for one church name (but the sign inviting passersby to worship was in English). New Jersey is a very cosmopolitan state, and we suspect a lot of foreign-born persons work in this area, but they don’t seem to live here. Maybe the cost of living is too high. We saw a housing development where, even post-Sandy, a sign said prices start at $400,000. If the Mason-Dixon Line extended into NJ – which it does not – we already would be south of it. And this is only our first day on the road. Congratulations,Good Luck,Godspeed and Happy Passover.You’re like a modern-day Steinbeck in Travels With Charley with Joey playing the role of Charlie and your bike as Rocinante,the trusty motorhome that Steinbeck drove to rediscover America.Stay safe and have fun. Wow! We bow in awe at your knowledge of Steinbeck! Seriously. You are way ahead of us on that. 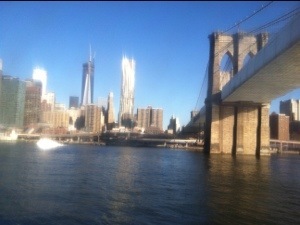 Happy Easter, stay safe back in the Big City & thanks for writing! Your descriptions of the familiar NYC/NJ landscapes read like a well researched and precise travel guide. As you may feel as if you have culturally crossed a “Mason – Dixon” line in NJ…when you do “cross the Delaware [River]” in the next day or two you will actually be in my state, Delaware, which technically is both North and South and even East of the lines drawn by Mason and Dixon. Just a little factoid to help prepare you for your short journey through our First State..home to VP Biden. Hope the weather holds up for you and no more spring snowstorm. From you, Geography Joel, that is good info & high praise! 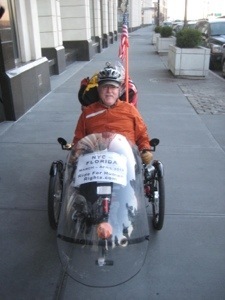 Jeff, wishing you a safe, easy ride. We had snow today in Buffalo. I glad you are heading south. just following your route, your reports and endeavors with respect & … envy. keep safe and warm and tell us where do you stay each night. if need help let us know. Thanks for the good wishes. We are staying at a bed & breakfast, the J. D. Thompson Inn. 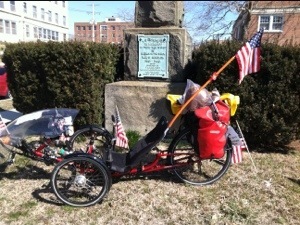 We don’t ask for special treatment but the owners kindly gave us a discount to support the Ride.